Cold and flu season is upon us. If you're feeling crummy, having a clean mouth can perk you up. Here are some dental care tips from your Lorne Park Dental Associates team that will help you when you're not feeling well. Although normally we love to see your beautiful teeth and smiles, when you have cold or flu be sure to cover up and cough or sneeze into your arm. Germ-laden droplets may remain infectious for several hours, depending on where they fall. To stay healthy, avoid nail biting too. Dry mouth can be a result of breathing through the mouth, rather than the nose, due to nasal congestion. 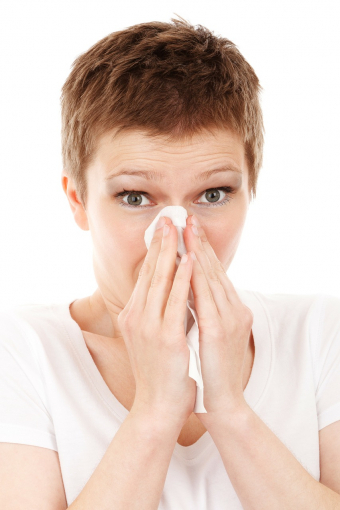 Taking medications such as antihistamines, decongestants and painkillers can also result in reduced saliva flow. Saliva is needed to wash sugars away and work against acids in the mouth. Without enough saliva you are at greater risk of developing tooth decay. Drinking plenty of fluids can help. Sucking on sugarless cough drops or throat lozenges helps keep your saliva flowing too. Be sure to check ingredient labels for sugar though. Many cough remedies are just like candy in that they contain fructose or corn syrup. To avoid cavities, choose sugarless products or those with xylitol as a sweetener. A warm cup of tea is always comforting when you have cold or flu, but try not to add sugar or lemon if you can avoid it. Sugars fuel cavity-causing bacteria and lemon is acidic and can contribute to tooth erosion. You may reach for sports drinks to replenish electrolytes when you are sick but be aware that they often contain a lot of sugar. Water is always a safe and healthy beverage choice. While 'under the weather' remember to use your toothbrush...It's always more pleasant to have a clean and fresh mouth! Rinse your toothbrush well after use. To sanitize, soak your toothbrush in an antibacterial mouth rinse between uses. If not left soaking, let your toothbrush air dry between uses when possible. Store your toothbrush away from other toothbrushes so that germs aren't shared. Once you recover, replace your toothbrush. Sharing is nice but a toothbrush is one thing that should never be shared. If your toothbrush is stored on the sink near a toilet, move it somewhere else. When you flush, germs become air born and can land on your toothbrush. Vomiting is often an unfortunate part of having the flu. When you vomit, stomach acids come up into the mouth and coat the teeth. It's best not to brush right away after vomiting so that you don't rub these acids all over the teeth and cause tooth erosion. Rinsing with plain water, diluted mouth rinse, or a solution of water and one tsp. baking soda and spitting out is recommended. Try and hold off on brushing for half an hour or so. Don't let cold or flu get you down. Remembering these dental care tips will take you a long way down the road to recovery. Our Lorne Park Dental receptionists are happy to help you re-book any dental visits that you may have to miss due to cold or flu. We hope that you're feeling great from head to toe and look forward to seeing you smile again soon!